As I said above, when I test it, this Sewer Wall Background displays as black. did you change the backgrounds at all? the game relies on the background to fill blanks in the tiling. ones of the few instances of the background setting that has it scroll at the speed tiles do. Did you just completely ignore Thierry? 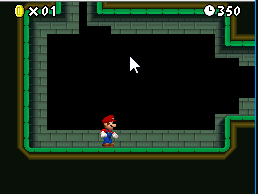 You need to set the correct background (which I believe is #30 Sewer wall) in order for the level to look proper. Please, don't be ignorant. Saying "help" won't get you far. are you sure that's the same person, though. different accounts.